Champion 75531i 3100 Watt Inverter Generator - the Best on the Market? 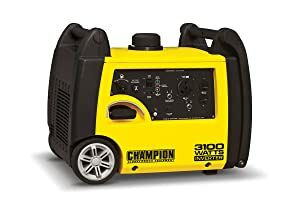 Champion Power Equipment 75531i Inverter Generator 3100 Watt has in recent times emerged as one of the highest quality inverter generators. If you are a big fan of a quieter working environment, then this model will provide you with just that. If you intend to get an inverter (and yes, they are better than conventional portable generators!) that provides a broad range of value and is relatively affordable compared to both the Yamaha and Honda models, then you might have just found the right match. Since it was launched, this inverter has been attracting stellar reviews from those who have had an opportunity to use it. Nonetheless, before making your final judgment, please follow my in-depth review. Engine Displacement & Power Output – located at the heart of the 755311i is the tough, 171 cc Champion overhead value engine that produces a fair power of 2800 running watts and 3100 surge watts. Runtime & Fuel Type – the 1.6-gallon fuel tank on this inverter is capable of running the unit for a maximum of 8 hours when fitted with ¼ of maximum load. This inverter runs on unleaded gasoline. Start Type – just like other middle-sized inverters, this model utilises a manual recoil Pull-Start. Power Panel & Outlets – it features all standard home outlets that include, 120 Volt AC, (1) 120 Volt AC, 20 Amp Duplex (NEMA 5-20R) outlets, (1) 12V DC outlet, and 30 Amp Receptacle (NEMA TT-30R). Additionally, the panel is fitted with a handy push-button circuit breaker, an overload indicator light, and an oil warning light. Noise Level – the noise generated by this type of inverter is rated at 58dBA at 23 feet, making it one of the quietest generators on the market. Size & Portability – this inverter measures 24.4″ long, by 18.3″ high, by 14.3″ wide. This inverter weighs 84.5 pounds which is a bit too heavy to carry it with one hand. This is totally understandable given the larger and more powerful engine than in most of the inverters. Fortunately the wheels make it still easy to move around. Enough power for single small to mid size appliances – the Champion 75531i features two outlets that you can utilize to supply the appliances that require an equivalent of 120V AC, 20 Amp current. CARB Compliant – this model complies with the standard net weight of the EPA/CARB compliant generators which is 83.8 lbs. (38 kg). Low weight – Compared with the Yamaha EF3000iSE’s dry weight of 147.4 Ibs and the Honda EU3000iS’s 134 Ibs, the Champion 75531i’s net dry weight of 84.5 lbs is a clear advantage. Champion Generators did a really good job with making it as lightweight as possible. Relatively quiet operation – designed with the inverter technology, this model functions quietly. Though it is not the quietest one, a noise of 58 dBA at 23 feet cannot really be complained about . Good runtime and fuel efficiency – in terms of fuel efficiency, expect this model to provide you with up to 8 hours of run time at 25% load. At the control panel is the Economy Control Switch, which will automatically lower the engine when it is not in use. Besides, the RPM features functionally automatically according to the size of the load, and, as a result, this reduces noise and minimizes engine wear. Portability – fitted with a built-in handle and wheels, you will find it easier to move it from one point to another. Other features that make this model live up to its hype include automatic overload protection, a reliable pull start and automatic oil shut-off. Though this unit is capable of running smoothly on flat surfaces, you may find it difficult to move it around rough surfaces because of its small wheels. While nominally quiet, this unit may give you more of a headache when working with moderate or heavier loads as it is bound to become a bit louder. Overall, the Champion Power Equipment 75531i Inverter Generator is a highly rated unit. This model runs relatively quietly, has good runtime and fuel efficiency, it is EPA/CARB compliant, and is highly reliable. Though you may realize that this model will at times run loudly under some loads, the noise is still perfectly tolerable. Nonetheless, if you intend to purchase the lightest, quietest and best-made inverters, by all means the Yamaha EF2400iSHC is the best. However, in order to purchase the Yamaha model, you will have to spend as twice as on the 75531i. Based on the wattage and price, you can opt for the 75531i.